We were away for a week in balmy BC, and enjoyed our visit immensely – the great food, wonderful local wines, the chance to get our hands into the garden, and mostly, the sights of spring flourishing all around us. All the birds both local and migratory, the trees and flowers in bloom, and the incredible vivid green of spring grass. 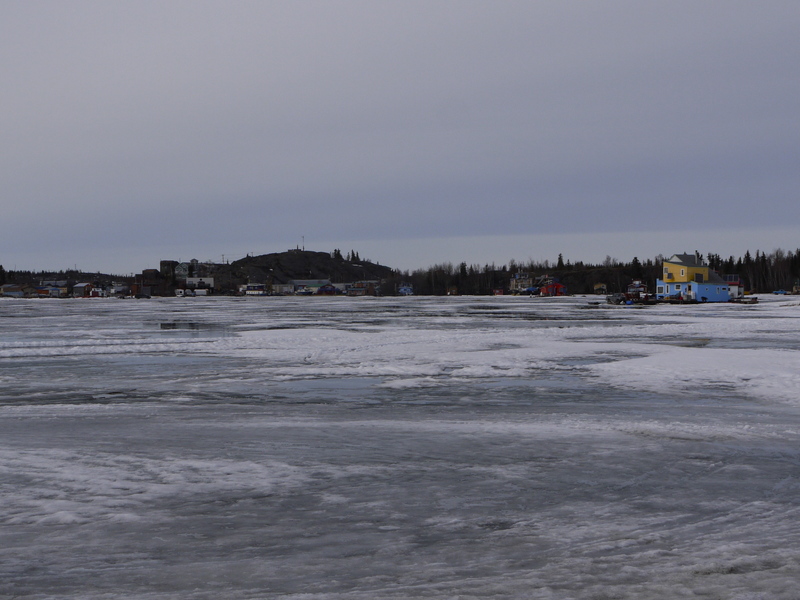 It was hard to come back to Yellowknife, to say the least. It’s been a nonexistent spring here so far – the temperatures haven’t hit above zero yet, and its been much more cold than usual. However, all that has changed in two short days, and we are reminded again of how beautiful and special this part of the world is. It’s been warm – even though the thermometer tells us the temperature is about 12 degrees, it’s warm enough for short sleeves and a beer on the deck. Because the day light is so long now – its still sort of light at 11 pm, the sun’s effects are powerful. The snow has been melting very quickly, leaving lots of water on the ice. 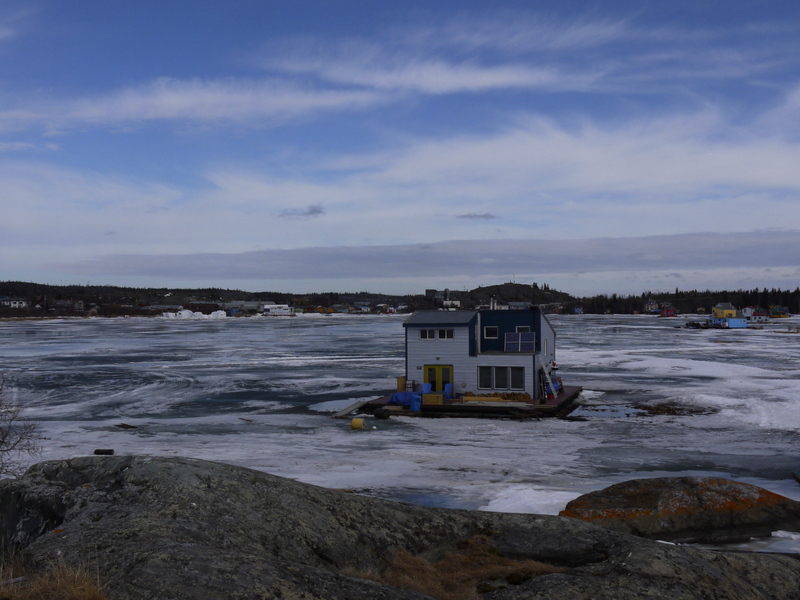 The ice is still thick enough to drive on, although it is unnerving to drive on the ice under 6 inches of water. However, the planes are still landing and taking off from the ice, and yesterday a grater drove by, so its obviously thick enough. The problem with vehicles is that soon, very soon, any day now, the ice at the shoreline will melt and we won’t be able to drive off and on the ice. So we’ll be back to walking for the next month. This is the time to do last minute shopping and trips to the dump. The ice will apparently undergo some interesting transformations. 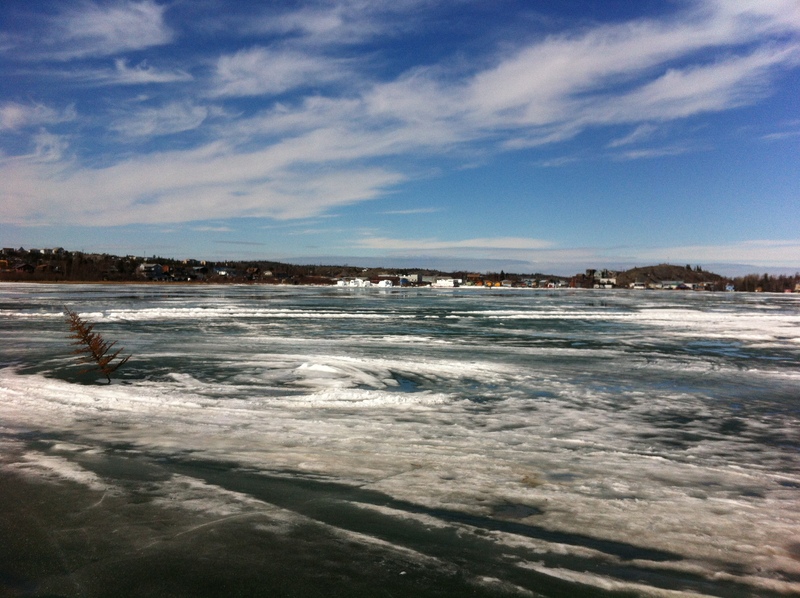 First the snow melts, and then the ice will dry out as it separates from the shore and pops up. The water will all run away, and the ice will ‘candle’. Apparently it looks like the top of a candle at this point. It will be dry and soft and white. This ice is safe and solid. 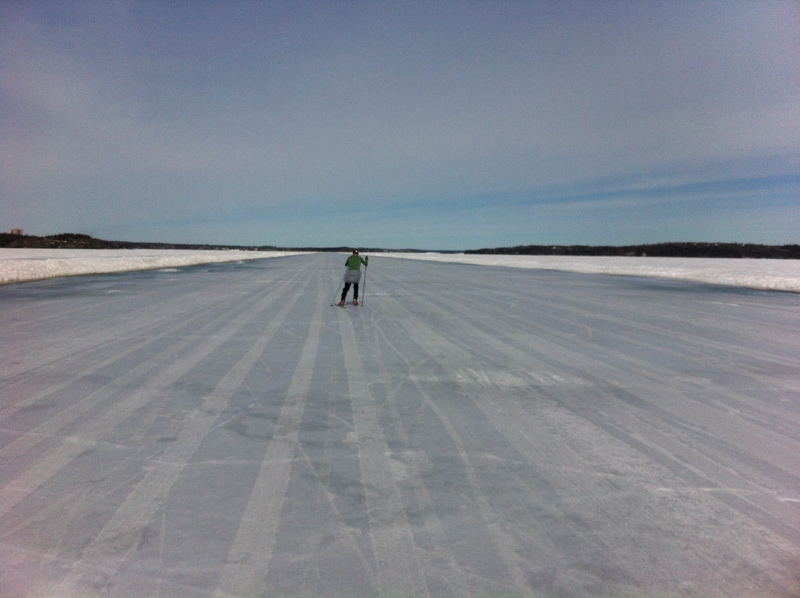 It’s already happened on the ice road ( now officially closed to traffic, although still used by the fishermen), which makes for terrific skate skiing and biking. The surface is textured, like hoarfrost, so it’s not slippery. After the ice candles, it apparently becomes black (safe) and then blue (not safe) and then it breaks up into large chunks, which can quickly blow out of the bay. The process can happen quickly. You can I guess go from walking on the ice to paddling on the water in only a couple of days. Around the houseboat things are a little different. Because of the solar radiation off the metal siding the ice melts beside the house quicker, and soon enough I guess we’ll be floating again. After that we’ll have to use our ice walker, also a water walker, to get off and on the main ice. I don’t know yet how the dogs will manage this phase. Luckily we’ve had 3 spontaneous offers of places to stay on land during the break up. We may have to do that, just for the dogs. Right now they are loving the warm weather and the chance to lay around on the cool snow. Along with the warmer weather of the last two days, the seagulls have come back. (Although what they might be eating is not at all apparent.) You can hear them calling from inside the house, and suddenly, it feels like summer. There is one pair that seem to have taken up residence on the small rock right beside our house, likely the same pair as last year. They don’t seem bothered at all by us or the dogs, however this might change when their babies arrive. And last night as I went to bed, for the first time, I could see the lights of town reflected in the water on the ice. Summer seems possible, suddenly. This entry was posted in North of 60, The Song I Live By and tagged ice, Ice Walker, Spring, The Song I Live By, Yellowknife Bay. Bookmark the permalink. Spring is such an interesting, complex process there. I did get just a little nervous looking at that last photo, though. The Christmas tree seems to be on the edge of a vortex – we’d hate to see you all pulled down into who-knows-what! Maybe we need to do a mash up of science, science fiction and Robert Service. Instead of “The Cremation of Sam McGee” we could have “The Spring of Ms. Tandi’s Tree” – or some such. I’ll take your word for it on that twelve-degrees-is-warm business. But I do understand how the longer days can make a huge difference in everything from the snow melt to general cheerfulness. Have fun with the approaching season! Oh, look! A new background! Is that one of your seagulls? No, this is a generic seagull from the internet. But the newest ice crystal background is one of mine. Be careful of ice that is truly candling. This is when the solid ice seems to develop into long shards sitting vertically beside each other and packed in solidly. However candle ice can break apart quickly when you step on it, push it with your paddle or bash it with the bow of your canoe. It is not safe ice since the ice is now melting from both the top and bottom. Watch out and stay safe. Thanks for this good advice! Who are you and how do you know about this? Yes, highly recommended. Especially when you have the whole road to yourself!